I googled it: Sonja was right, krumkake is indeed Norwegian. krum (Norwegian) is indeed the same word as krumm (German). Both come from Middle Low German. I just see in preview that K posted. I knew I was on rather thin ice, describing what I thought was a Swedish food in the presence of actual Swedes. The things you learn on BetterMostm, eh? I love that we're such an inhomogeneous bunch. There's always someone you can ask. Did it look a bit like this? It's called Schillerlocken in German (=Schiller's locks) - but don't ask me why, I have no idea. And they are winded. You take a narrow, long piece of dough and wind it around a form. Maybe this type of cake/cookies made its way from Germany via Norway (or the other way round) to the US. 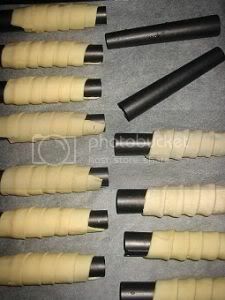 Looks like Schiller's locks to me! Johann Christoph Friedrich von Schiller (November 10, 1759 - May 9, 1805), usually known as Friedrich Schiller, was a German poet, philosopher, historian, and dramatist. Schiller is the main project of Christopher von Deylen (born October 1970, in Visselhövede, Lower Saxony, Germany) , a German musician, composer and producer. He has won the ECHO-award (2002) for the Best Dance-Single of the Year. By the way, Chrissie--see what you've started? At this very moment I am listening to a Schiller playlist! Thank you so much, Meryl, for the lovely tartan scarf AND the lovely pre-Hogmanay evening--have a Guid New Year! Cannoli are Sicilian pastry desserts. The singular is cannolo (or in the Sicilian language cannolu), meaning "little tube", with the etymology stemming from the Latin "canna", or reed. Cannoli originated in Sicily and are an essential part of Sicilian cuisine. 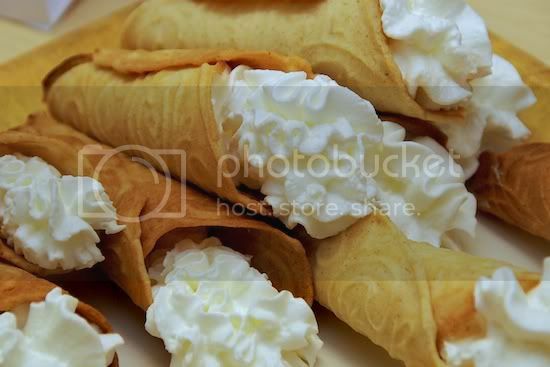 They are also popular in Italian American cuisine and in the United States are known as a general Italian pastry, while they are specifically Sicilian in origin (in Italy, they're commonly known as "cannoli siciliani", Sicilian cannoli). 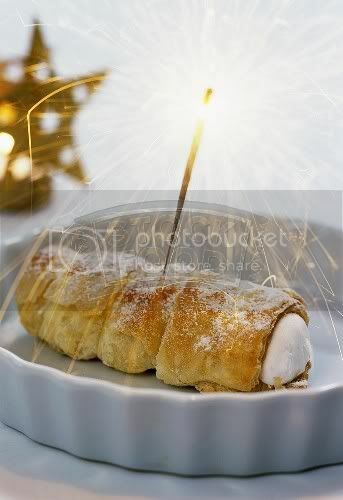 Cannoli consist of tube-shaped shells of fried pastry dough, filled with a sweet, creamy filling usually containing ricotta cheese and chopped succade. They range in size from "cannulicchi", no bigger than a finger, to the fist-sized proportions typically found in Piana degli Albanesi, south of Palermo, Sicily. I stand corrected again! I should probably just stay away from this thread. I knew I was on rather thin ice, describing what I thought was a Swedish food in the presence of actual Swedes. Anyway, my friend's family is Swedish by descent (Soderberg), so I guess they think of it as Swedish. But according to Wikipedia, it's Norwegian. Yeah, thought so. But as far as I know, they are also made in some parts of Sweden, don't know what they're called here though. Not krumkake anyway. Oh yes, maybe I do know what they're called after all. The name 'gorån' comes to mind. Have to check it though. You described them very well. This was what I imagined when I read your description of how they're made. Oh, a joke! I can live with a joke! For a minute I was afraid you thought canneloni was Swedish.